5. I got to meet my editor, and the team at Balzer+Bray and HarperCollins. a. Here's Kristin in her office. She's thinking "Someone take that girl's camera away!" Kristin is a big deal. You can tell because she has a window, and I learned that windows in New York City are prime real estate. Windows are like gold. They are currency. As in, "That car will cost you an arm and a leg, or you can just gimme your window." That's how New Yorkers negotiate. Most New Yorkers have to pay the arm and the leg, because everyone has an arm and a leg, but nobody has a window. b. I also got to meet the Balzer (Alessandra) and the Bray (Donna). There are no pictures of them. Someone warned me that if I took a picture of Alessandra, she would make sure I'd never receive a window in any city. 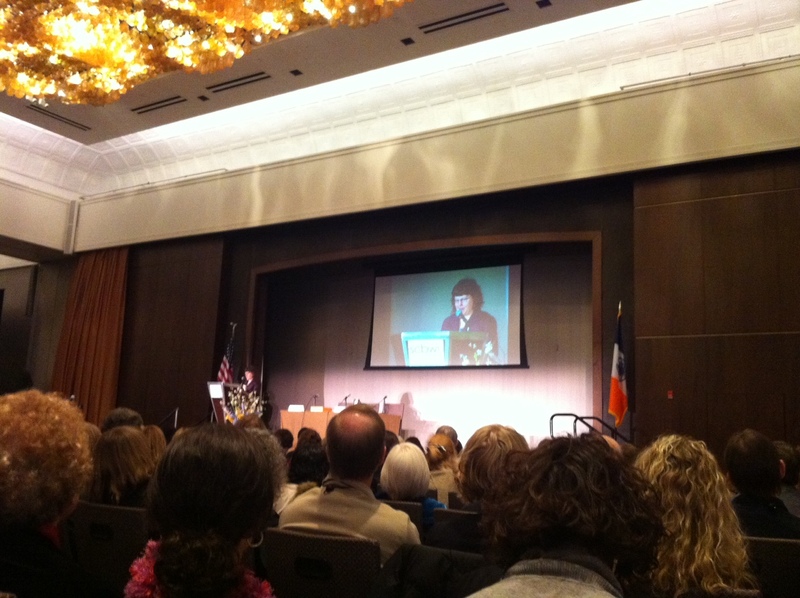 Despite the threat, they were both charming, and Alessandra delivered a kick-a speech the next day at the conference. c. I met Kristin's right hand. 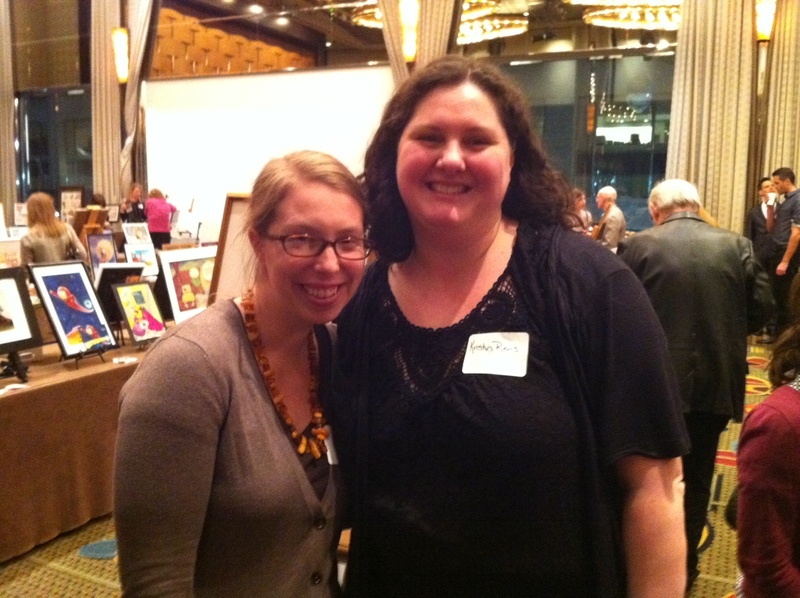 I also met Sara Sargent, Kristin's assistant, and an editor in her own right. Rite? Wryte? Sara and Kristin. My Book is in their hands. 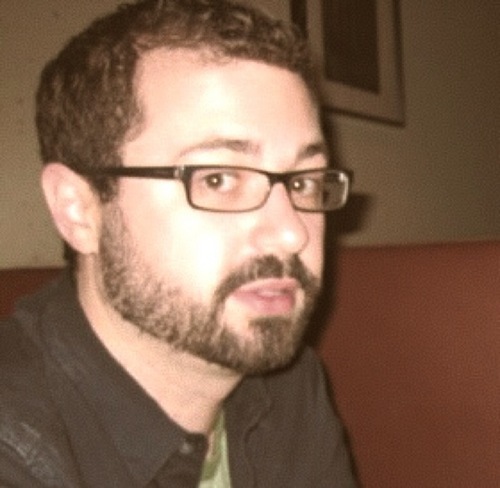 d. I met the lone man on the Balzer+Bray HarperCollins team, Jordan Brown. This was very exciting. I wanted to take pictures, but I didn't want to scare The Man, because they are so rarely spotted in the wilds of the HarperCollins jungle. I observed The Man for several long minutes, though, and was pleasantly surprised to learn his eating and drinking habits, and social customs, are very similar to mine. I stole this from his Twitter account. At the meet-and-greet, Michael and Jordan talked mostly to each other. And the rest of the girls mingled. It was like a junior high mixer. e. I met so many other wonderful people on the sales, marketing, and publicity side. I won't try to name them all, for fear that I'll leave someone out, and for bigger fear I won't keep all their names straight, and for biggest fear this list will be way too long. Okay, on to number... Six? We're only on six? Who's idea was it to put alphabetical sub-numbers? 6. Sara Zarr killed at her keynote speech. She was incredible, moving, entertaining, everything you want in a speech. She received a standing ovation for her words, and it was well deserved. I am honored to know her. 7. I got to hang with my niece Leena. That's us at Lombardi's Pizza, where the air is so thick with the smell of garlic that it's impossible to get a clear picture. Just kidding. That picture was taken by a tourist who was intent on disproving the theory, "It's as easy as point and click!" 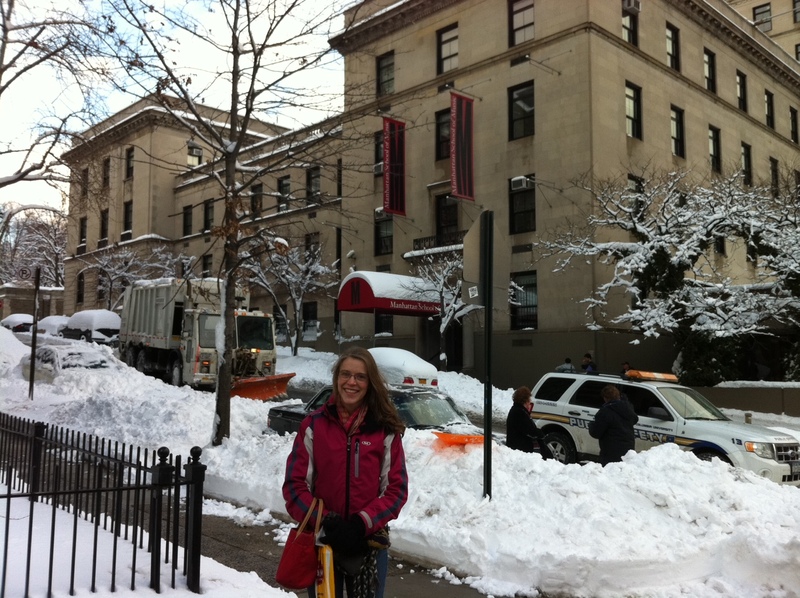 Later, we got to visit Leena in her natural habitat, the Manhattan School of Music. She lives inside the school, in an incredibly messy dorm room. I found myself very jealous she gets to live this experience. It's just like Anna and the French Kiss! Although Leena assures me there is no french kissing going on. 9. I learned what a Kentucky Brown ... something is. At lunch with Michael and Kristin, I saw a strange menu item called a Kentucky Brown something. I can't believe I can't remember the name. I'm thinking "Kentucky Brown Boy", but that can't be right, can it? I mean, that sounds a little... wrong. Anyway, the dish was a piece of brioche, with turkey and bacon on top, smothered by beschamel sauce. I couldn't get the picture before I'd already taken a few bites. 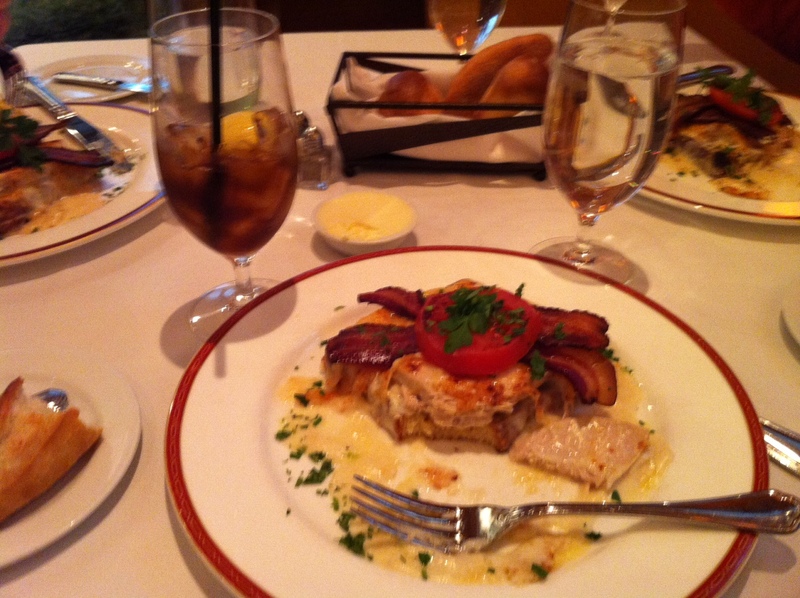 Kentucky Hot Brown! That's what it was called. And I'm suing the restaurant for making my jeans too tight. Okay, let's call it quits there. 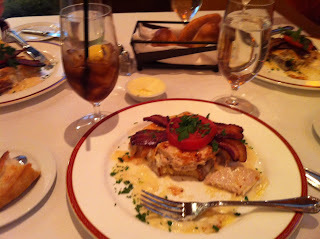 I'm exhausted, and all I can think about is the Kentucky Hot Brown, and how I'd fly to New York just to eat it again. Enough about me. How about all y'all? Speaking of "y'all", I met a fellow writer Bryan Bliss, who assumed I was from the South. When I told him I was from Utah, he's like, "Well, that's like the South." Yeah. Utah is totally the South. Of Idaho. So, what's everyone up to this week? Anyone else ever eaten a Kentucky Brown Boy? If I wasn't already completely addicted to your blog (et al), I'd stop reading in a fit of jealousy. Instead, I've decided just to live vicariously. That's healthier, anyway--that Kentucky Hot Brown looked like the death of my diet. 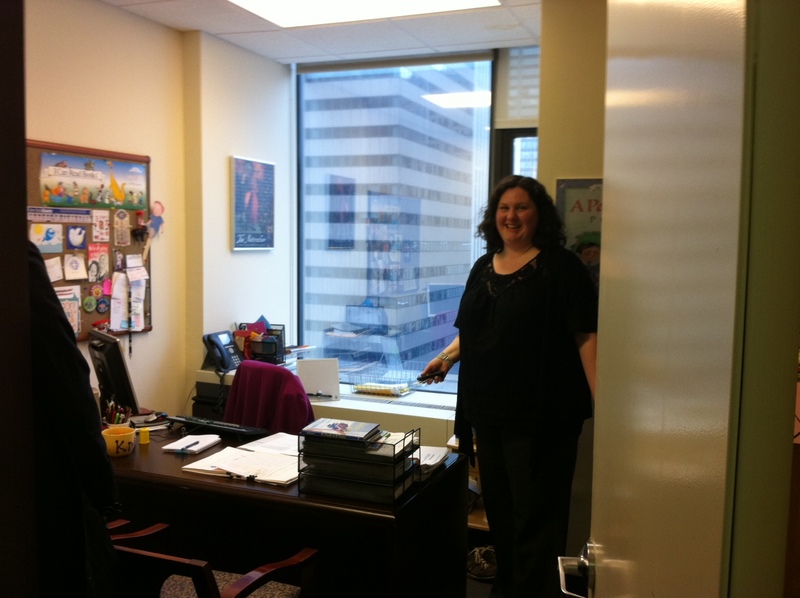 The wedgie thing caught me a little off guard--but I still laughed and pretended to be shocked to myself in my little office--with a window. I was also relieved to hear about Leena's kissing habits! I LOVE Lombardi's!!! And the best thing about Lombardi's is that right across the street is a Pinkberry AND Rice to Riches!! Two dessert choices!! TWO!! Okay. I'll calm down now. Sounds like you had a great time in NYC! Robin- Don't be jealous! You can have lunch with my niece any time you want. And the Kentucky Hot Brown would be a good, honorable death to any diet. Shari- Lombardi's is so so good! The day after I shared a pizza with my niece, I went back again, alone, and ate an ENTIRE pizza myself. It's probably a good thing I didn't notice the dessert options! Great post, Brodi! You're making me wish I'd used my camera more often...It was great to meet you out there, too! Katy- Thanks! I loved meeting you and your crew. I would like to be adopted in, if you don't mind! Jenni- I knew someone would catch that! Why am I not surprised it was you? Wow. I'm impressed someone out there has worse photography skills than I do. How sad it was manifested at the expense of you and Leena having a picture to cherish. Looks like you had a good time in spite of that. I have! I'm living in Kentucky right now. They're pretty common over here. I've heard the one at The Brown hotel is the best in Louisville, Ky, but you're looks delish. 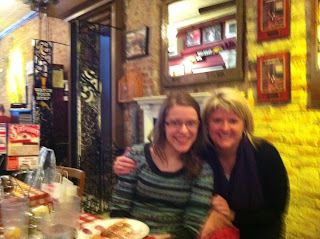 Emily- I wish you'd have been there, at least just to take a better picture! Bethany- It's a good thing I don't have daily access to them. I wouldn't fit through my door! I used to live right by the Manhattan School of Music. That photo made me miss New York! I am so jealous of your trip! Sounds like lots of fun, I totally would have given up a window to come along. You know I love you. I just like to keep you on your toes and honest. :) It sounds like you had an amazing trip in Manhattan. I'm so glad and so so jealous. The first and last time I was in Manhattan was almost seven years ago. I hope to return someday. Alyosha- I loved that neighborhood! Quiet, but still part of the city. Lulabell- Come with me next time! (For only 2 easy payments of 2 windows). Jenni- Everyone should go at least twice, I think. What a fun time! Who knew there is more than one Sara Sargent?!! Margaret- I know! It made me like her immediately. I read some blogs about sara's keynote. It sounded incredible! I wish I could have seen it in person. This trip sounds magical. So magical I can smell that garlic. The Blog Post I didn't want to Write. Stuck with me? Lucky you!